Simple, low cost, automatic, and diversified: that's how I invest. There are so many options today when it comes to investing. Just to name a few: savings accounts, money market funds, stocks, bonds, rental property, gold, CDs, TIPS, ETFs, and selling put options: From keeping cash around the house to complex financial derivatives, the range of investments is endless. In order to sort through the increasingly complicated world of financial investments, everyone should have their own personal investing principles. These are ideas, rules, and beliefs that govern your financial decision making. When you write out your personal investing principles and spend some time thinking about the life you want to create, it clarifies your decision making process. When presented with a new investing opportunity, such as peer-to-peer lending, or online real estate investing, or buying gold inside your IRA, you can review your principles to see if the new investment strategy matches your goals. Personal investment principles can change over time. As your knowledge of investment vehicles grows, you can rewrite, review, and revisit your beliefs. Some of your key principles will remain consistent throughout your life, but others will change. My principles are based on keeping my stress levels and decision fatigue to a minimum. Decision fatigue is why it's so hard to stick to diets and only have one drink when you go out with friends. You can only make so many decisions a day before your brain grows tired of choosing. That is why lifestyle design is so powerful. Create the life you want by removing your barriers to success. After thousands of hours of reading, research, and studying, my four principles summarize the essence of the teachings of Warren Buffett, Jack Bogle, Burton Malkiel, and other intelligent, successful leaders of the investment community. By following my principles I never worry about how the market is performing. I never check the stock ticker on my phone. In fact, I disabled all market notifications on my phone and computer. Day to day, it's just random noise. I check my account balances with Personal Capital, but only to record my net worth once a month on the first. I review my asset allocation and performance once a year in May, but do not spend much time thinking about these things the rest of the year. I am content with the average market return and focus on what I can control: costs, savings rate, and creating systems that enrich me and those around me. From 1916-2016 $1 invested in the S&P 500 grew to $674 when adjusted for inflation. Just in my lifetime, every dollar invested when I was born until last Christmas grew to $8. That is a tremendous wealth generation machine. Run the numbers yourself here. Simple means I can explain to my grandmother or teenage cousin what I am invested in. Unfortunately for them, they have had to sit through a few lectures from me. (Sorry Grandma!) If I ever have to start using Greek letters or math higher than algebra to get my point across, I do not believe that the investment is simple enough. Simple also means that there are few or no additional decisions to be made after I make the initial decision to invest. For instance, I stopped using Lending Club and no longer invest in peer-to-peer lending because of the difficult I found reinvesting. 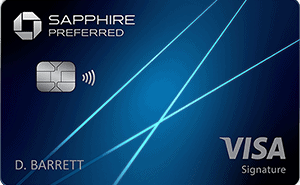 Imagine if you had to log back into Vanguard every month to manually purchase more bonds. Too much time and effort spent eking out a barely higher return than my Vanguard and TSP index funds. I like investments that are set and forget. Betterment is one I am using at the moment. 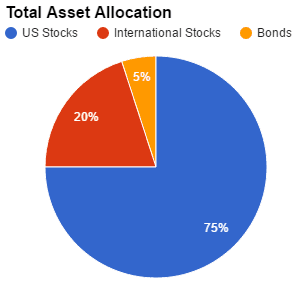 I set the asset allocation (90% stocks, 10% bonds) and Betterment handles the rebalancing, dividend reinvestment, and everything else for me. 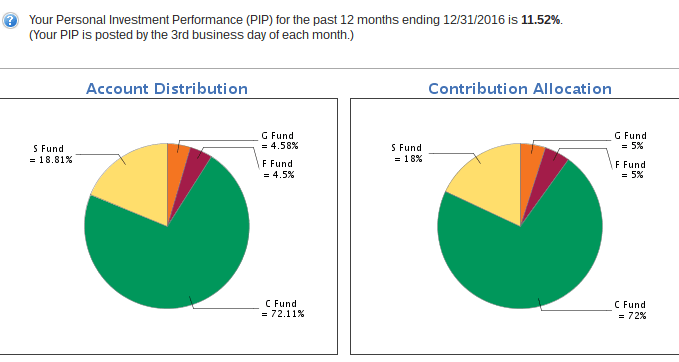 Vanguard Target Date Retirement Funds, Vanguard Lifestrategy Funds, Wealthfront, TSP Lifecycle Funds: all of these are very much hands off once you set them up. Simplicity means keeping things low stress and low impact on my life. Unlike many things in life, when it comes to investing you do not necessarily get more when you pay more. Jack Bogle explores the math behind investment returns in The Little Book of Common Sense Investing. The returns of all market participants must be the average return, minus fees. Therefore, if you can minimize fees and just buy the index, you will do better than at least 50% of all market participants, and realistically better than many more amateur investors. Vanguard has an excellent calculator that shows you the tremendous effect that fees have on your returns over the years. Anytime someone mentions an investment to me that has a fee higher than the TSP's 3.8 basis points (0.038%), I run it through the Vanguard investment cost calculator to see how much of my returns will be lost to fees. 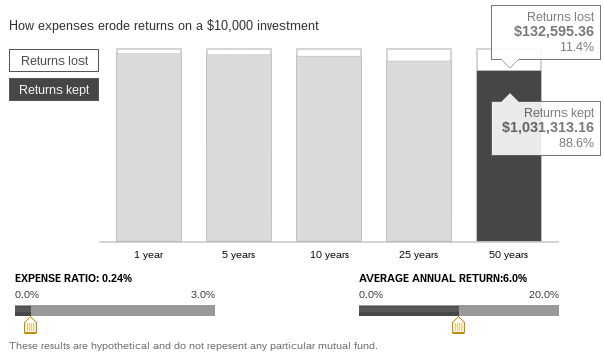 Even Betterment's 25 basis points over 50 years adds up quickly and you will end up sacrificing 11% of your returns to your robo-adviser. Make sure if you are paying more than 10 basis points for any investment that you can justify sacrificing thousands of dollars in future returns. Costs are one of the few things you can control when investing. Returns and performance are largely out of your control as an investor with less than a few billion dollars. You cannot buy whole companies and change their management structure or find efficiencies like Warren Buffett does. You can minimize your costs and select an appropriate asset allocation, so focus on getting that right. Maintaining an internal locus of control while investing keeps me happy, stress free, and wealthier over time. Automation is an extension of simplicity, but it makes such a difference when it comes to automating out poor decision making, human errors, and decision fatigue. Automation is a subset of lifestyle design and sets you up for long term success. When you create automated investment systems, you remove yourself from the equation and just let the math and money go to work for you. For instance, you can set up the TSP or any 401k to automatically deduct from your paycheck. Your Vanguard IRA can pull money every payday from your checking account to maximize your retirement contributions by the end of the year. 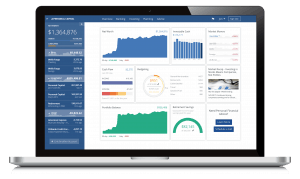 Your TSP can automatically contribute to the funds you want or you can just use a TSP Lifecycle fund and completely remove the guesswork of building a diversified portfolio on your own. Whatever you do, set it up so you pay yourself first and make it EASY to invest and HARD to spend. When you artificially reduce your paycheck by automatically saving and invest, your lifestyle will adjust accordingly. Make your investments automatic and take yourself out of the loop. It's been said before: never have all your eggs in one basket. Make no mistake, investing is a risky business. Wikipedia lists 8 types of financial risks. That doesn't even factor in behavioral risk, which can have a massive impact on your returns. Market timing, missed opportunities, not taking on enough risk, paying too much in fees: these headwinds are all working against the average-Joe investor. There are always risks in any venture. You can mitigate those risks by spreading your investments around in many asset classes and across many businesses. When I was a child, I thought it would be impossible to diversify efficiently. How could you possibly buy a share of every company in the market when a single share of Google was over $600? Low cost, passive index funds are the answer. Even if you only have $125, you can buy a single share of VTI (Vanguard Total Stock Market ETF). Now you own a very small slice of every publicly traded company in America. How amazing is that? For just $50 more you could buy VXUS (Vanguard Total International Stock Market ETF) and own shares around the world in mature, developed, developing, and emerging markets. Capitalism has become far more democratic and open to the average investor. You no longer have to tie up all of your assets in just a few companies or be well off to diversify your net worth across many asset classes. Thanks to Vanguard, Schwab, Fidelity, Blackrock, the TSP, and other large investment firms, cheap diversification is available to nearly everybody in the first world. Take advantage of the opportunities presented in today's market and diversify your investments. There's no excuse for an Enron, Lehman Brothers, or Worldcom scenario when investors lost all of their retirement savings because they had everything invested in one company. Diversification should be a cornerstone of every successful investor looking to achieve rapid financial independence. Simple, low cost, automatic, and diversified: that is how I select my investments. These four principles have served me well during my investing life over the past 14 years. I believe they will continue to serve me and my family through the next 100 years of investing, no matter what the latest investing fad is. Dear Reader, what are your personal investing principles? Have you ever thought to put them down on paper? Please share your thoughts on your own approach to investing in the comments! Fantastic post. I agree with your points, especially as the commentator before me noted, diversification. For me, diversification is important both when it comes to investment, and when it comes to income more broadly when striving for financial independence. Thanks for sharing, and hope you have a great weekend!